I have spent a good couple of hours crouching next to my Stachys plant, camera in hand, fascinated by the drama rapidly unfolding around it. And the news is, that the first Wool Carder bee males appeared today. Early in the morning the females (at least three of them) were feeding and gathering wool in their usual way, when one individual started chasing around others. I checked and, yes, it was a male. A beautifully fresh one (pictured above). It gave the impression to rest occasionally on a leaf or stick, but on close inspection he was moving his head incessantly, visually scanning around looking for potential 'illegal' users of his newly declared kingdom. 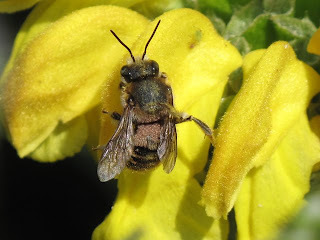 Since the Stachys started flowering on the 11th of June at least three bee species have been more or less regularly feeding on the Stachys. Bombus pascuorum the most common one, then Apis mellifera, the Honey Bee and occasionally Bombus terrestris. Now they are under attack. Attacks today were not very often and the I didn't see any matings, but maybe it's because is the first day. A honey bee was quite persistent and came back several times after being pounced upon by the male. The male moved between the Stachys and the Phlomis, and I managed to see both a male and a female feeding on the Phlomis, the male after a few tentative tries, managed to push the flower open and feed. The female in search of pollen, lifting the upper lip of the flower to expose the anthers. Wool-Carder bees have a special attraction for Lamiate plants (the mint family) and these are the only two flowering in my garden at the moment. The sage and the lavender are not in bloom as yet. After a while I noticed there was a second male. It looked like it was covered in dust, but when I checked the photos they were actually mites! I saw females with mites too, especially around their 'waist'. The male seemed to be a bit bothered by it and keep trying to clean his head. This actually makes both males - if there are not more - easy to tell apart. You can see from the photos. was pushing his way into a Phlomis flower. 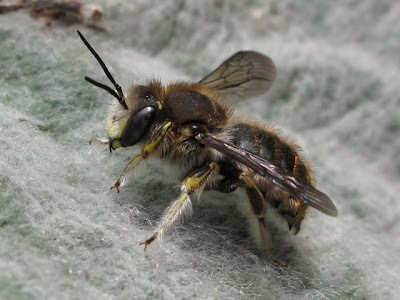 And before leaving Wool Carder Bees - for now! - I recently came across a fascinating site, the Biodiversity Heritage Library, a formidable project by which 10 world-leading institutions, including the Natural History Museum and Kew Gardens, are to digitize their library collections. The site now includes over 13,000 books and journals scanned and freely available to download to everyone. It is also fully searchable. It has now become my favourite site to find out old literature about a species - the type that is not usually available in your typical university library. In this site I came across this beautiful drawing of Wool Carder bees, illustrating the size differences between males and females. The illustration is taken from "The Cambridge Natural History", ed. by S.F. Harmer and A.E. Shipley, v 6. 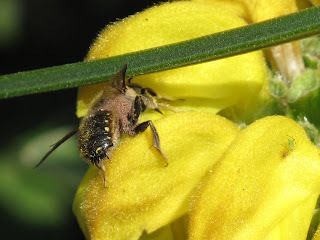 Anthidium manicatum, the Wool-Carder Bee. 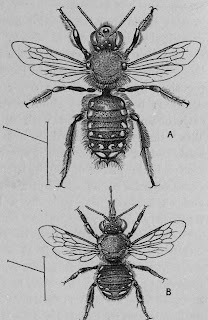 A, male, B, female. I'm located not too far from you (Just accross the Humber) but I haven't recorded Anthidium yet. I'll have to get some Stachys! 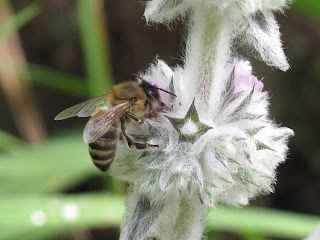 I am trying to grow some native Stachys sylvatica too in my garden, but the hairiness of the Stachys lanata has really not parallel so I wouldn't be surprised if they prefer the garden plant! Your blog entries always make me smile. Your affection for these little creatures just shows. :-) We had some of these fascinating bees in our garden last year, and like you, I found the protective males totally endearing. They're so dedicated and fearless. What are slugs up to on your kitchen floor?